Home » Neumont ‘University’ Faculty: Student Teachers? No PhDs? Head Of Admissions Has No College Degree? According to Neumont University’s online faculty database, up to 6 of their professors and administrators may not possess a college degree of any kind. In addition, none of their current professors appear to hold a PhD degree from any field of study, despite the institution’s ongoing assertion of their “university” status. By academic traditions dating back to at least the Medieval era, a “university” is made up of multiple scholarly colleges, each of which is focused on a specific field of study, such as the physical sciences, or the humanities. In modern times, each college within a university offers degrees at the bachelor’s, master’s, and PhD levels, and is held accountable to their university’s campus-wide policies. Contemporary universities nearly always maintain an on-campus research library, and faculty members must possess a PhD degree in their given field. Neumont University, however, a for-profit and regionally-unaccredited school based in Utah, seems to believe otherwise. 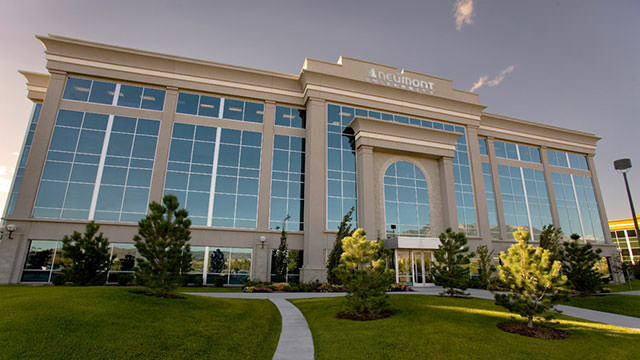 Neumont’s educational offerings consist solely of 2-year career training programs in the field of computer science, yet the institution has branded itself a “university” ever since its inception in 2003, both within its Delaware company registration papers (“Neumont University LLC“), as well as within all marketing materials presented to prospective students in the United States, and around the world. Emails sent by CollegeTimes to each of these Neumont employees, asking whether or not any of them currently held college degrees of any level, from any field, issued by any established college or university, were not answered. Interestingly, consumer reviews of Neumont submitted to CollegeTimes also claim that the institution has hired former students directly to faculty positions upon completion of their career training program. Josh Krebs, a professor of “algorithms” and “software development” at Neumont who recently graduated in 2010, appears to be one such faculty member to which this claim may apply, as he is listed (among other Neumont employees) as holding a “Bachelors of Science” degree issued by Neumont University, without further credentials. Update 1/21/2013: Neumont University appears to have hidden the profile of Charlotte Westphal, Director of University Relations, from public view after CollegeTimes revealed that her bachelor’s and M.B.A. degrees were merely issued by the University of Phoenix’s controversial and widely criticized business programs. Her profile is still viewable by clicking the above direct link. Craigslist: Neumont University’s Secret Weapon? In September 2012, a former student claimed on CollegeTimes that Neumont also had the questionable habit of recruiting new faculty members by posting classified ads to the well-known Craigslist.org website, which hosts free local ads displayed by region. When asked by CollegeTimes’s former web host, Little Bizzy, whether or not this was true, and whether or not the school had difficulty recruiting professors that held PhD degrees from regionally-accredited colleges, Neumont’s attorney in Las Vegas, John Krieger, refused to comment. However, when the CollegeTimes team started digging deeper into the issue, we found something eerily similar to the student’s claim. CollegeTimes discovered that on December 19, 2012, Steven Allison (sallison@neumont.edu), whose LinkedIn profile describes him as an “instructor” at Neumont University (even though he is not currently listed on their faculty database), seems to have posted a classified ad on Craigslist’s Salt Lake City section seeking immediate “programming” help for a website project being developed by Neumont University. Update 2/1/2013: It appears that Neumont University has recently deleted this Craigslist post in response to the CollegeTimes story. 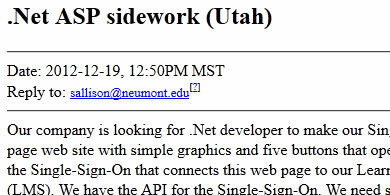 The Craigslist ad above shows Neumont University faculty offering money to any computer programmer that can help them finish a web project. If Neumont denies the practice of using Craigslist to seek out under-qualified faculty hires, the above discovery raises serious doubts. Furthermore, if Neumont’s backup argument is that career training schools should not require academically-qualified professors (i.e. advanced degree holders) because a “college degree” is not necessary in order to properly teach students computer science skills that ready them for a successful career in the field of technology, well, the above discovery yet again raises very serious doubts.